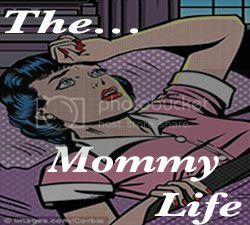 The Mommy life: Were we really prepared to be parents? Were we really prepared to be parents? I sometimes wonder, who in this world really is prepared to be a parent. I am sure there are quite a few who are. I, I dont believe I was one of them. I never really liked kids, I found them an annoyance to be around. I still do. I do not like to go to the kids jungle gyms indoors and be amoung 100 screaming bouncy kids. When I became pregnant with my first daughter Abigail it was kind of like "Ok, I guess here we go". She came to me in June of 2010. I was a mom. I had no idea what to do with this little baby. I am so thankful for my mother as I just plain didnt know. Did you buy a bath Susan, washcloths? No, of course not. You have to bath these babies ;) With a little guidance I got it. Nobody prepares you for that surge of emotion you get when you have in your arms this little baby, whom is part of you, something you would do anything for, do anything to protect. I was not prepared for this. I sat in bed and cried, a lot. I was scared, scared of being a mom. I dont know what to do with this little baby. Post Partum Depression set it for a bit with me. I snapped out of it within a month. I didnt even know I had it until it was gone. Now dont get me wrong, I fell in love with both my babies instantly. But wow, what a change to your life. Being a mom is a big deal. You are the one to feed them their first year of their precious life. You are their safety, their love, their food. You are there everything. Was I prepared to have someone depend on me 24/7? Absolutely not. I felt saddened, like I had given up my freedom. I think I never spoke of it because it is sort of taboo to feel that way when you are a mom. You should be so in love with this little baby and overjoyed to have them take all your time. But really? Is this really how everyone feels? I somehow doubt it. Abigail is now 4 going on 5, so I have had time to adjust. I have accepted that my time is no longer mine however I dont pretend I dont miss when my time was all mine. We all joke about going to the bathroom and never alone because the kids are there staring at you or asking a million questions. But in truth, dont we all just want a little alone time? At least to pee? A shower alone without hearing screams on the other side of the door or knocking to get in? It is not easy being a parent. You go from having all the time in the world to do what you want to living around someone elses schedule. Your house is and will never be the same, toys will encroach every corner you can imagine. The laundry, my god the laundry. If you didnt like it before, prepare yourself for loads and loads never ending. We all love our children that is no doubt, but they change our lives. This past 5 years was not an easy run for me. It was a lot of ups and downs and the learning curve was huge. But here we are, almost 5 years later, down two bouts of post partum depression and two bouncy happy little girls. My life would not be the same without them, I would not be the same without them. As a mother, as any parent, I love them to the core. I would give my life for them. 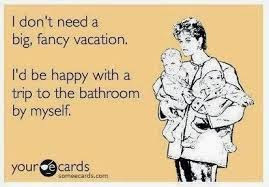 But my dear little children, mommy wants a break, a break from the millionth time you said mommy, at least to pee! Thanks for visiting my blog. Returning the favor. No, you are not alone and after raising three girls, I wish I could tell you the times will get easier. They will in some ways, but then new issues arise that will get you quoting all those quotes you posted. But, in the end, when they are gone (and yes, they will eventually leave the nest), you will look back and say, "where did the time go." You will actually at times, miss the noise, miss the wanting them in your space, even the laundry, yes the laundry. So, from one mommy to another, embrace this time, make sure you find time for YOU, alone, away from kiddos (no guilt here either) and love on them! I am doing my best to schedule alone time for my own sanity haha. Time does go by too fast. Very true. Lol, great post. You sure brought back memories for me. I don't believe the things you describe ever leave. Once you give birth, you are a mother forever. I remember telling my daughter when she turned 16, that I had been tired for 16 years. I was so happy she would be able to drive herself and I could get some rest. However, I just stayed up worrying until she got home. I agree with Michelle, once they are gone you appreciate all of the moments that you will never experience again. Wanting to spend time alone is a natural thing. Take the opportunities when you can. Ok I could have swore that I commented on this last night! But it was late and I was pretty wore out when my "reading time" rolled around. I am totally there with you girl. 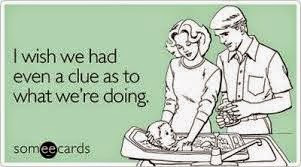 Parenthood can damn aggravating sometimes! Kids can be assholes, which in turn can create assholes out of we the parents! Thanks for sharing with #momstermondays! You rock my friend! I was not prepared in the way I thought I was. It has been a true learning experience and as you say our lives would not be the same without our kids. I feel exactly the same. You are so not alone in this. Having children really turns your world upside down. I love them so much, but I'd love to have a bath in peace, or just for once be totally selfish and do whatever I wanted. It's hard because people go "it's so worth it" and "I wouldn't change it for the world" - of course bloody not, but it's still damn hard! I thought I was ready as I have lots of experience with kids and really enjoy being around them but nope. I had no idea that I would have almost no time to myself. I love my baby but it is really hard. And there are lots of not fun parts. Lots and lots. Lucky for me so far the amazing parts outweigh the not great parts. You are definitely not alone. 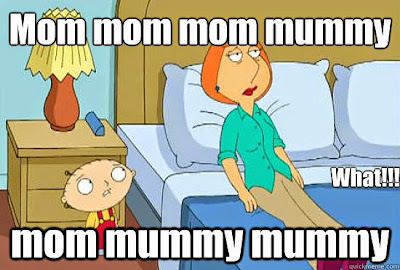 I was like you....not very maternal. I still aren't really. I have a son, and I love him heaps, but I'm not what you call a 'kid' person. I hear ya! I definitely would not say I was prepared (even though we waited until we were married 5 years before having our first)! I don't think anyone is really prepared. Found you on #twinklytuesday. Thanks for sharing! I get you. We all read in the books about that crazy love that you have when the baby come, I didn't feel that, I didn't know her. My love as a mother grown within months but I had to know her, I had to know what to love in her. Now I really cannot see my life without her. Thank you so much for reading. Life changes so much with children its amazing. 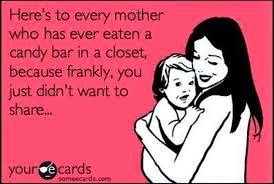 I'm not a parent yet but I'm sure my mom would relate to all of this! hehe I am sure she would. Thanks so much for reading my post. This is so familiar! I love my kiddos to distraction, but I would love to enjoy a wee bit of silence every now and again! I am overjoyed that people can relate. Makes you feel a little less lonely on the subject :) I miss sitting and reading too. The second you open a book or magazine they are on you like flies on .... haha. Nope. Not even a little bit prepared. Thankfully kids don't come with instruction manuals. Can you imagine what that thing would be like? 15,000 pages. Just on bath time. Thankfully, the bar for parents is pretty low. Is your kid alive? Yes. Is he doing anything that will actively cause him harm at this moment? No. Then you probably are doing OK.
hahaha that would be a long manual. Your comment made me laugh and laugh. Grest post, I'm sure loads of people relate to this! Love this! Thanks for sharing at the #HomeMattersParty - We hope to see you again soon! The door is OPEN! I wasn't ready, I went through a chemical pregnancy and then found out I wasn't actually pregnant and then I actually fell pregnant and it was like 'omg! I am so ready for this!' and then the time came where I was told I had to have a csection 4 weeks early and I wandered around the hospital ward in a daze crying 'I'm not ready', it was crazy. I was totally ready for my second though, once you go through the first kid it isn't so bad, I had learnt a lot since my first in the space of two years, I still have a lot to learn but I can 'deal' with my second a lot easier haha! Talking with spirits. Do you believe? When the kids are away the parents will.....RELAX!!! Rides, Love em or hate em? The toys are vintage.... are..... we vintage?